Renovating an old kitchen to both better meet your needs and conform to today’s design trends can be a challenge but it is a worthwhile one. Regardless of the age of your home, it is likely that attitudes towards efficient kitchen design have evolved since it was built. Once seen as a purely utilitarian space that should be hidden from guests, the kitchen has transformed into the functional and social center of the home. Packed with fancy fixtures, expensive finishes, and high-tech appliances, the kitchen is the new standard by which we judge the style and modernity of a home. Modern kitchens often utilize a series of simple tricks designed to keep guests nearby but out of your way. Instead of making the kitchen larger in order to accommodate guests, create an adjacent space with allows guests to enjoy your company and keep up a conversation while you prepare meals, wash dishes, or pour drinks. The best way to do this is by creating a natural barrier such as an island or peninsula of cabinets. If well designed, your guests will unconsciously understand that they should not go any further and you will be able to move around your work space easily. One of the best ways to keep people out of the kitchen and thus out of your way is to give them as few reasons as possible to be there. As kitchens are often centrally located and may be the location of yard or garage access points it can often become a thoroughfare for lots of traffic that has nothing to do with food preparation. When possible, separate circulation from the work zone and locate frequently accessed appliances such as the fridge on the perimeter of the work zone. Bigger kitchens are rarely better from a functional standpoint and a compact work zone always leads to a more efficient kitchen. 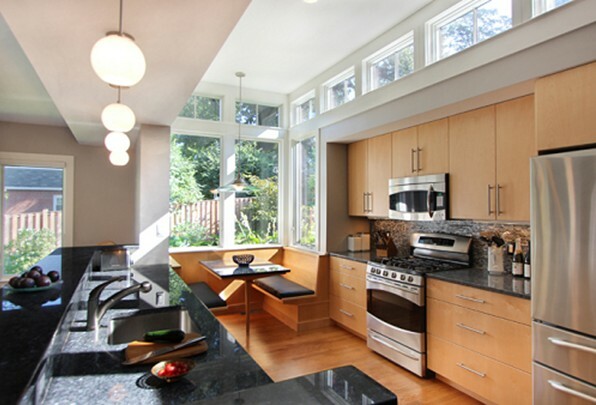 In fact, the only compelling argument for a larger kitchen involves storage space and additional eating space but these can both be satisfied with perimeter pantries, cabinets, and seating that does not enlarge the work zone. One of the hardest decisions to make in designing a kitchen is how to balance the desire for natural light with a need for sufficient storage options. Creative cabinet solutions are available which allow primarily below-counter storage but another great option is to locate the windows at the top of the wall, allowing space for cabinets and appliances beneath. This will provide plenty of natural light without taking up valuable wall space. The materials and finishes you choose will have a huge impact on the feel of your kitchen. For a modern look, glossy cabinets and brushed steel appliances can create a very clean and bright atmosphere. For more traditional or cottagey designs, sticking to stained wood cabinets and stone countertops will create a cozy and inviting atmosphere.